After a sumptuous lunch… I asked my hubby to go to SM Baguio and look for some panghimagas…bitin ako sa complimentary dessert eh…hahaha…. 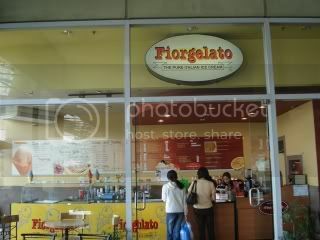 Gusto ko ng ice cream so we headed to the third floor to look for a kiosk that serves delicious ice cream. Until I remember there’s a gelato there. 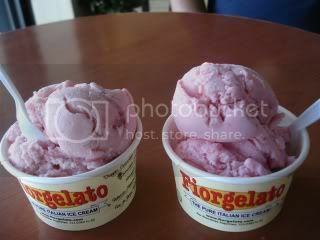 I ordered for a small cup of strawberry ice cream for just P 35.00 and it’s a sure steal! Sobrang sarap pala ng strawberry flavor nila with really chunks of strawberry in it! 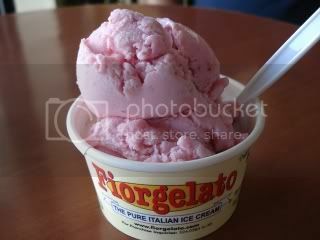 I admit, hindi ako fan ng strawberry ice cream pero sa sarap ng strawberry flavor ng Fiorgelato ay talagang hinahanap-hanap ko na siya. 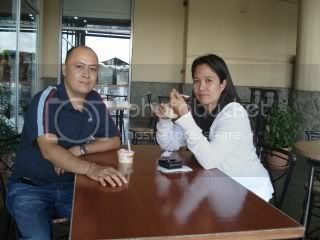 But since I have a diabetic husband with me, so problema ko kung ako lang ang kakain di ba? To my surprise they also have sugar free ice cream too! I ordered the same flavor for my husband and it taste good too. There’s a very slight difference lang cause they used different sweetener in it. But he really enjoyed his gelato too, he swears! i like the choco- mint flavor!